For over thirty years, Coastal Masonry has provided unrivaled experience, scope evaluation and aggressive scheduling capabilities to our customers' projects. Coastal's clients rest peacefully knowing that the value and reliability we provide on every project is unmatched in the South Florida masonry marketplace. Coastal Masonry is committed to delivering value and creating the positive team environment that is crucial to getting any project completed on time and within budget. Our track record of successful masonry projects of all sizes is undeniable proof to our dedication to this winning formula. Our years of experience give us the unique ability to evaluate every project's scope and provide expertise in scheduling and value engineering on a case-by-case basis. Contact us let's discuss how we can help get your masonry project done right! 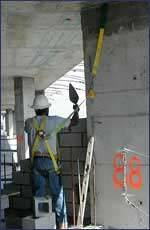 We are one of very few Florida masonry contractors that employ a full time safety director. We've received numerous awards for our proactive and innovative safety programs since all of our superintendents and foremen are 30 hour OSHA certified and our labor leads are either 30 hour or 10 hour OSHA certified. We are confident that our safety program differentiates us from our competition and we pride ourselves on providing a safe working environment for our employees and our projects. A safe company is a successful company! 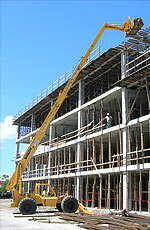 Coastal Masonry always strives for the highest level of service and delivery of the highest quality product possible. This focus to detail sets us apart from the competition. Gordy's Equipment Rentals, supplies and maintains all of our equipment, together with our significant "in house" program we'll never get stuck without the tools to get the job done right.